no need to count sheep. Each winner has been notified and will be gifted with quality yarn in their choice of color family and weight. Thanks to everyone who stopped by to offer birthday wishes, a comment or to submit their haiku. You added a little something to my week. So how did I spend my birthday? I hopped a train headed away from the teeming millions in the greater metropolitan area to visit my yarn dyeing friend, Rebecca a couple of hours south of Chicago. A little pizza, walkabout and general relaxing and it was time to come back home, but not without an indescribably soft surprise package of laceweight silk and mohair. At some point, Rebecca also slipped two chocolate chip cupcakes into my bag, making the ride back to the city a bit sweeter. You’re a sneaky one and for this, I thank you. I made it home just before big, sloppy raindrops began falling. Just inside the back door, I found a box containing not one but two dozen red roses from a long-time friend. Yes. It was a very good day. Sorry to be wishing you birthday cheer so late, but I hope this year is a great one for you. Nice birthday yarn and a great friend! I hope Rocky resisted the flowers! Sounds like a perfect way to celebrate a birthday. What a beautiful roses! Sounds like a heavenly way to spend a birthday! I’m so glad it was a happy one, you so much deserve it =) Happy Thursday, now! Sounds like a wonderful birthday – Congrats to the winners. Gosh, I LOVE the Red Hot Chili Peppers! OMG! 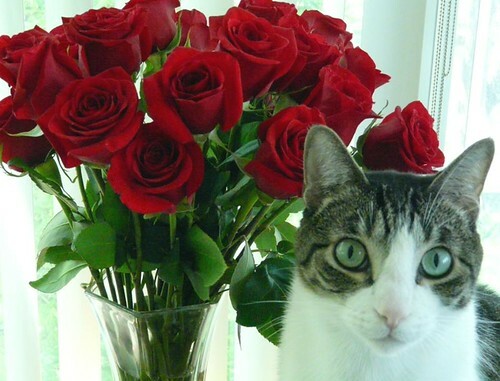 2 dozen roses and the most gorgeous (STUNNING!) 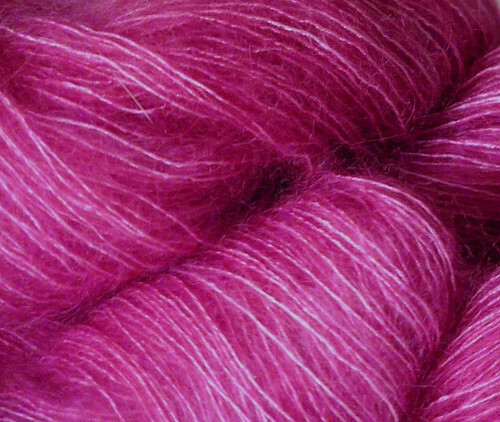 fushia mohair/silk!!! it sounds like a fantastic way to spend your day! and those cookies…so thoughtful. i love little surprises like that. and the roses! ahhh! heavenly. I’m so glad you had a happy day – I’m so sorry I was “absent” but I’ve been really sick again. PS – That Rocky is SO CUTE!!!! I’m glad you had such a fabulous day! I can’t remember if I wished you a Happy Birthday already. So here goes, Happy Birthday, Karen! The roses are fabulous! I hope they smell good too! Glad you had a lovely birthday! That mohair/silk blend looks heavenly! And happy birthday again. It sounds like you had a wonderful day! What a lovely way to spend a birthday. Food, friend, fibre, flowers. Can’t ask for anything better, eh? ooh, FIRST annual? I think it’s a great idea to start a tradition in honor of your birthday. My personal tradition is that I always take the day off. I know, not terribly creative, but effective! Aw, thank you!!! How exciting!! So great that you made it down to visit Rebecca. Congratulations to the winners and Happy Birthday! BTW, I adore that picture of Rocky. Just beautiful! What a great picture of Rocky.